It’s that time of year again; when a chocolate orange counts as one of your five a day, you begin to wonder how you functioned without 12 hours sleep every night (with an afternoon nap), and an elasticated waist is your go-to fashion item. Trouble is, gratitude isn’t what’s given you a belly to rival Buddha’s. 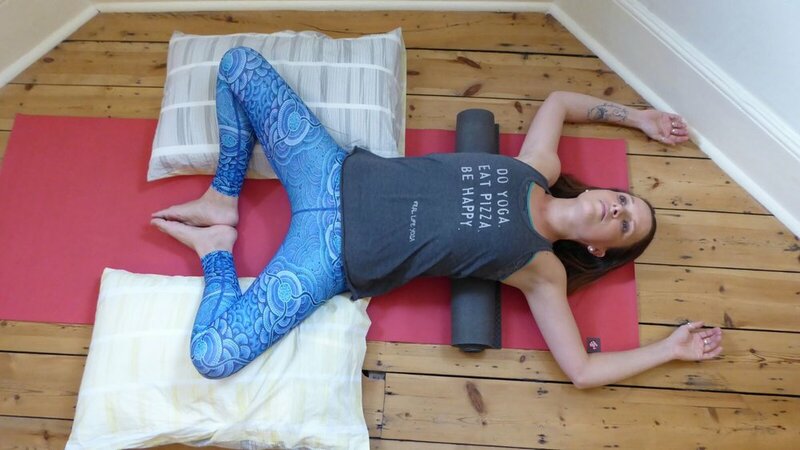 As tempting as it is to roll yourself onto the closest soft furnishing, resolving to stay there until Spring, there are a few yoga poses you might like to try. By gently moving the body you can give the digestive organs a bit of stimulation and help them to do what they do best. 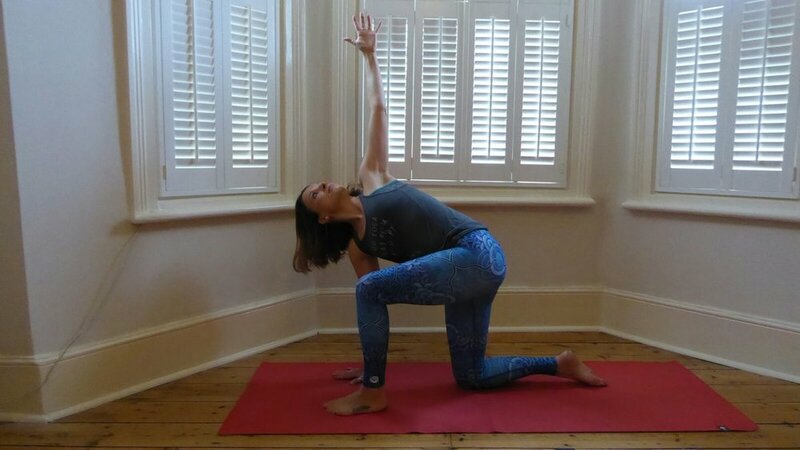 When you hold these poses for 1 or 2 minutes, you also help the body to settle into it’s natural ‘rest and digest’ state. Your parasympathetic nervous system kicks in, allowing your whole body to know it’s safe, secure and can relax. And the more you can move, increase circulation, and create space in your abdomen, the more room you have to put more gorgeous goodies in. Before you start gently go through a couple of rounds of your favourite type of sun salutation. But remember that this is all about be slow and steady! Lie down. Bring both knees up into your chest. Take a little roll around from side to side. (Health warning: This one is known as ‘wind relieving pose’. Just saying.) Pause there. Let both knees drop down to the left. Take your arms up into a cactus shape. Look to the right. Let gravity do the work as you rest there and breath. Repeat on the other side or as often as you feel is…. *ahem* needed. Still lying on the floor, bend your knees up into your chest but this time take them further apart so they’re moving more towards your armpits than your chest. Either stay in this version, or bend the knees and turn the feet up to the ceiling. Reach up and hold each foot, gently drawing the knees further down towards the armpits. It’s not glamorous but it’s good! Come to rest on your knees. Bring the big toes together but take the knees apart. Lower yourself down onto the floor, allowing you belly to rest between the knees. Reach your arms out towards the front of the mat. If that’s not comfortable, rest your forehead on a block or stack your hands and use them as a pillow. Pause here; breathe. And maybe have a little think about what your next snack should be. Chocolates on the floor; chocolates on the shelf. Rest your right knee on the floor and step your left foot forwards. Place your right hand down on the floor inside your left foot. Think of twisting from behind your food baby (around your belly button), push down through your hand and feel how that opens you up across your chest. Reach the left hand up, imagining your favourite chocolate hanging just out of reach. Repeat on the other side. Take yourself into a squatting position. If your heels can’t comfortably reach the floor, rest them on a rolled-up yoga mat, or prop with a folded blanket. Keep your spine as long as possible. Bring the hands into prayer and gently use the backs of the elbows to keep the knees rolling apart. Think of lifting your heart and allowing your tail bone to drop down towards the earth. You might like to know that this is the favoured position for pooping in many parts of the world, so it’s obviously a good one to get stuff….umm…moving. Keeping an eye on the kitchen. Come to sit. Keep the left leg straight, bend the right and place the foot flat on the floor. Place your left hand behind you and try to rest lightly on the finger tips. Use the back of your right elbow against the inside of your right knee to gently encourage the torso to twist. By twisting this way, instead of the ‘usual’ version of twisting towards the bent leg, there’s plenty of space for the food baby. You can also keep an eye on the kitchen in case someone else goes for the best snacks. Rest both knees on the floor, hip width apart. Prop your feet up on your toes. Start with your hands on your lower back. Inhale and lift up and lengthen through your spine. Exhale, push your belly button forward and let your head gently drop back. If you can, reach down and place your hands on your heels. Keep the feeling of pushing your beautiful full belly forward, as you feel long through the front and back lines of your body. This one takes a bit of preparation. I’ve used a rolled-up yoga mat with a cushion over it, but a tightly-rolled blanket would also work (even better is a real bolster!). Kneel down and put whatever you’re using up against your tail-bone. Slowly lower yourself down so that the bolster is lying along your spine. You can either take the arms up over your head, or let them rest down by your sides. Be very kind to your knees; try and keep the thighs in parallel lines. Stay there and breathe. You’ll need the bolster from the previous pose for this one too, and another pillow. Lie down and bring the soles of the feet together, with legs bent. Position a pillow under each knee so the legs are comfortable. Take your rolled up yoga mat (or blanket) and position it so that it’s across your back, lying just at the bottom of your shoulder blades. Drape yourself over it, either with arms up over your head or down by your side if that’s uncomfortable. Relax, breathe, smile and be grateful. Well done. Now go have an After Eight and some Baileys. Oh just stop showing off, will you? There are many things that annoy you when you’re a yoga teacher. Demo-ing your first downward facing dog of the class, realising you’ve left all your hairbands at home, so battle inhaling your own hair for the next 90 minutes every time you talk. Watching as half the class copy the person in the front row who is blatantly there to show off their bendiness and paying no attention to your invitation to work on the basic version of the pose first. The moment when one ad-hoc, off the cuff response to a students question has more of an impact on the class than the whole thing you’d spent quite a long time planning. Of course, honesty is the best policy. So I had to say “I don’t know”. Even though that’s not strictly true. I know exactly how to do it. Unfortunately my body hasn’t quite caught up with my brain. In my mind I’m floating up and down like Kino Macgregor on a bungee chord, but when I try to replicate in practice what my mind can rehearse perfectly, I’m less Kino and more sumo. It hadn’t occurred to her that it wasn’t just about flinging yourself into the perfect upside down version of yourself, hanging out there for a while, and effortlessly getting yourself the right way up again. It was a bit of a surprise to her that, like baking a cake, not only do you need all the right ingredients to make something tasty, you don’t bother putting the icing on until the rest of the cake is baked just right. Even if you sprinkle sparkly stuff on it, you’ve not got a cake – you’ve got potential food poisoning which looks pretty. This isn’t just about handstand, though, or any of the ‘whoop look at me I can do this so it must mean I’m super good at yoga’ poses. To really get to be good at anything, we need to break it down into small steps. Hell, some days you might not even feel like you’re stepping – it may be more of a crawl – but forward momentum, however small, is still forward. Yes we’d all like to change the world and make it a better place. But the reality is we can’t. We’re just one person. So start by changing your own little corner of the world. Smile at a stranger. Let someone else have the last seat on the bus. Put a positive note in the pocket of some jeans on sale at the clothes shop. Buy the person in the queue behind you at the café a chocolate treat. Start cultivating the yogic notion of ‘ahimsa’ (translated by some as ‘non-violence’), by putting a little bit of compassion out there into the world. Maybe you’ll get it back, maybe you won’t. That’s not the point. Just do it. Pranayama is an incredibly powerful set of breathing practices which we, as yoga practitioners, should all incorporate into our daily routines. Yeah – I know. Chance would be a fine thing. Apart from the fact that they should be explained by an experienced pranayama practitioner (and they don’t come along that often) it’s yet another thing we need to squeeze into our already packed days. So start small. When you’re on your mat, see it as a breathing practice and make your breath the focal point. See if you can begin to find how it feels to let the breath be the one thing that the mind is focused on. Ok, it’s not pranayama, but it’s a skill you’re going to need when you get there. Like it or not we’ve all got that one pose which we hold in our minds as the one we really need/want/yearn to nail. For me, it’s bridge pose. I know that I’ve got a whole heap of mental and physical ‘stuff’ going on around anything that asks me to open my heart, so pushing myself into a beautiful bow is just never going to happen without a whole heap of careful negotiating with my body and breath, over a long period of time. Whatever your equivalent pose is, get curious about it. Read about how it works anatomically, see which poses can help prepare the body for it, and take your time to have a little play with it. Become a master of multi-tasking. To get a better understanding of all the wonderful ways that a yoga practice can benefit your life, you really need to start delving a bit deeper into the words rather than just the shapes. Of course, reading wonderful things like this blog are a great place to start, but finding the time to immerse yourself into anything weightier can seem impossible. So get a podcast to listen to on your way into work (I highly recommend the Yogaland Podcast by Andrea Ferretti, available on iTunes). Or find a good yoga audiobook you can soak up whilst walking back from taking the kids to school. Work out how you can break down the challenge of getting some yoga theory into your life to compliment your practice. Do a little. Do it often. I know – one day you’ll have the kind of smooth, flowing, inspirational 90 minute yoga practice that will send most of the Lycra-clad contortionists on Instagram reaching for the cookie dough ice cream in despair. I hate to be the one to break it to you, but if you’re not doing a little something every day you’re never going to get there. So whilst I heartily encourage you keep that dream as your destination, start the journey sooner rather than later. And start it small. Get on your mat as often as you can, even if it’s just for 10 minutes. Better to do 10 minutes of super soothing sun salutations, than snarling at supple, slinky people on Youtube. In 4 sleeps I have to run the furthest I have ever run in my whole life. It’s (only) a half marathon; and I say ‘only’ because I know there are people doing incomprehensibly physically and mentally challenging things every day. And to be honest I wish they’d stop because I shouldn’t feel like I need to call my challenge ‘only’ 13 miles. Pack it in, you lot; you’re making the rest of us look bad. Anyway. Despite the fact I’m quite bendy, and can get through a fairly challenging 2 hour yoga practice with only a small amount of whimpering and a bit of swearing, it turns out that does not make one immediately able to run for the same length of time. What I have found particularly interesting (although not really surprising) is that it’s my mind that gives me trouble way before my body does. I’ve barely left the house and the voice in my head is telling me how tight my calves are, how much my knees hurt, that the burning in my lungs is really bad, and that soiling myself/rupturing an artery/annihilating a hamstring is inevitable, so I should probably stop now. In the world of yoga we have a term which is ‘tapas’. Sadly, in this case, it does not refer to delicious small plates of Spanish delicacies. Tapas literally means heat, fire or discipline. It relates to the transformative nature of an experience that pushes you through your comfort zone and brings your mind up against its own perceived limits. It is the metaphorical fire that burns off all the stuff which has held you back, so that you can evolve into an even better version of yourself. Spoiler alert – when you’re incorporating tapas into your life it probably isn’t going to be the most fun time. But if you can get through it then you’ll emerge, like a phoenix from the flames, transformed, stronger….and possibly a bit sweatier. So when I’ve been pounding the pavements over the last few months, and particularly when I’ve had to up the mileage and deal with an even louder voice in my head, I’ve been trying to channel the tapas. When stuff gets uncomfortable, instead of trying to ignore it and shut it down (because it just gets louder) I’ve been trying to embrace it. Don’t get me wrong – I’m not some sort of masochist but if I can realise that every minute or mile that I push on through, I’m burning off more of the crap that has been weighing me down and holding me back – physically, emotionally and spiritually. Some days it has been all about the fear of setting up my own business, whilst other days I’m fighting through the pain of missing my Dad and coming to terms with his death. Then there are the other times when it’s a mixture of being unkind to my body for the last 23 years, facing up to the fact that I probably won’t have kids, re-playing every dysfunctional relationship I’ve ever had, remembering every time I feel like I’ve failed at something, and getting my head around the fact that I’m 40 this year. I did warn you that tampering with tapas isn’t fun. It’s a cornucopia of unpleasant surprises as something ‘new’ comes up to bite you in the Gluteus Maximus. But with every sweaty, angry, sore, really-feckin-annoying step I take, and every time I decide to keep going instead of stopping, I burn a little bit more of one of them off. I’m still not filled with delight at the thought of 13 miles on Sunday; it’s something I never thought I’d do and am still not sure if I can. It’s still going to be the longest distance I’ve run with my body, but more than that – it might just be the furthest I’ve come in my head. And I’m on fire, baby! Can't be arsed to do asana? Mention that you ‘do yoga’ to pretty much anyone, and you’ll probably get one of these responses; 1.) Ooh you must be really bendy. 2.) I wish I could do yoga but I’m not bendy. 3.) Does someone always break wind in class? Ignoring the one about flatulence, it can be a common misconception that yoga is all about the stuff we do on a sticky mat. It’s easy to understand why when almost everything we see about yoga usually involves someone being bendy. After all, a photo of someone being compassionate isn’t going to get you much social media action – regardless of whether or not the person doing it is in Lycra. The silver lining to this is that even on those days when wild horses couldn’t drag you onto a yoga mat, there are still oodles of opportunities to practice. The even better news is that some of them are actually enjoyable! We know that yoga is an art and science through which we can create an enduring connection between our body, mind and spirit. Through it we get happier and healthier on every level, by being able to live in equanimity regardless of what life flings at us. Of course, it’s easier said than done, but if you’re looking for the closest thing to a ‘How To…’ book, Patanjali’s Yoga Sutras is where to start. Despite being many thousands of years old, it offers us a framework on which to build our yoga practices, which is still relevant here in the good ole’ 21st century. If we look at the eight different ‘limbs’, or pathways, first of all it becomes obvious that one is no more important than any of the others. (Nope – not even getting a foot behind your head. Sorry about that.) There’s no one-size-fits-all approach, so just by practicing some of these we’re still doing our yoga. Ahimsa is a term that comes up quite a lot in yoga, and it’s definitely open to a million interpretations. But the one thing we can all agree on is that it’s more than just non-violence. It can be as simple as an intention to be kind in thought, word and deed. And if you really want to challenge yourself, try being kind to yourself in thought, word and deed first. Once you’ve got kindness nailed, how about moving through your day with an attitude of friendliness to everyone regardless of how they are towards you? Don’t get me wrong – I’m not suggesting you to walk around all day with a fake saccharine smile on your face, or being superficially pleasant to people. But consider how you can bring your best expression of kindness, as often as you can – even when you’re tired, got PMT, and the person in front of you took the last seat on the bus. You’re probably going to find this suggestion as a foundation of any set of guidelines of ‘how to be a good person’ so no surprises that it forms a part of our yoga texts too. In the yoga sutras it’s called ‘satya’, but it’s more than just omitting the truth about whether or not you had the last chocolate in the box, or how often you floss your teeth. It’s also about walking your talk. Finding positive principles to live by – and doing it. You know the subtle, gnawing feeling when you’re not living your truth, whether that’s telling a massive porkie-pie or just a little omitting of honesty. It just doesn’t feel good. Spoiler alert – it isn’t easy. The best way of summing it up is perhaps through this great quote by Gloria Steinem – “the truth will set you free, but first it will p*ss you off”. The fact you’re reading Om Magazine shows that you’re obviously a human being of impeccable moral fiber. But the fact is, we’re all thieves. We’re all stealing stuff that isn’t ours (what Patanjali calls ‘asteya’). I’m going to take a guess and assume that none of use are quite at the level of running off with the Crown Jewels, or even being light-fingered in the local corner shop. Without awareness, however, we can be unconsciously taking things which aren’t ours to take. You can suggest that taking a little bit of stationery from the office isn’t the end of the world. Likewise not owning up when the waiter accidentally doesn’t charge you for a drink. And surely taking praise for something that wasn’t all your idea won’t hurt? This definition of non-stealing doesn’t just mean that we shouldn’t take what’s ours, but we should also be mindful of taking advantage of a situation so that it unfairly benefits us. If it hasn’t been freely given to you – don’t take it. ‘Saucha’ is loosely defined as cleanliness or purity. Sadly, just having a good wash isn’t quite going to cut it (although it’s an excellent place to start) because it refers to your inner and outer world. Asana is great for getting our body and mind working well but it’s not the only way. Pranayama (breathing techniques) plays an essential part in keeping the home of our spirit (our body – not the drinks cabinet) clean too. But if we want to bring the quality of saucha into our lives, we can start with a good ole’ spring clean. You know how good it feels to finally do that massive de-cluttering mission – that’s saucha. And if clearing out under the bed hasn’t scared you, have a go at de-junking your mind too; find all those thought patterns which no longer serve you and clear them all out.